Peugeot has revealed a striking new 3008 flagship called the 3008 GT, inspired by the 308 GTi and available to order in November. Prices aren’t announced yet but don’t expect change from £30,000. Available only with the most powerful engine in the new 3008 range, a 180PS 2.0-litre BlueHDi diesel, buyers can have a GT with either a six-speed manual or six-speed automatic transmission. That said, Peugeot will also offer a GT Line edition that basically looks the same but is available with lower powered petrol and diesel engines. Peugeot says that the 3008 GT is “aimed at individuals looking for a new driving experience,” suggesting that this will be one of the most dynamically credible crossovers ever made. Time will tell on that front, but it can look the part at least, available with the two-tone ‘Coupé Franche’ paintjob (above) that makes a 308 GTi so equipped look very unusual. GT Line models are available with it too. Both GT and GT Line models come with a 12.3-inch digital instrument display in front of the driver, as well as satellite navigation, full-LED headlamps, 18-inch alloy wheels, blind spot detection, lane keep assistance, and a wireless smartphone charging plate. However, only full fat GT models will come with 19-inch two-tone alloys, wheel arch extensions, nappa leather upholstery, a massaging driver’s seat, panoramic glass roof, adaptive cruise control and en electronic tailgate. 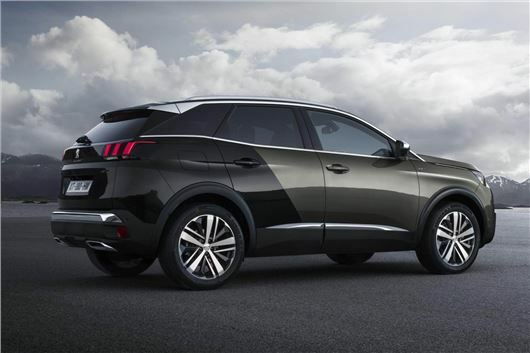 Peugeot only unveiled the new 3008 model in May, and it's due to be shown in the metal for the first time at September’s Paris Motor Show. Highlights include a 520-litre boot (90 bigger than the outgoing 3008’s), greatly improved cabin space and quality, and an overall weight reduction that should make it both more efficient and better to drive than its rather lumpy predecessor.